During my somewhat disappointing search for hidden remains of the Roman wall along Bevis Marks (see previous article in this series), I was chatting to a tower crane operator working on 6 Bevis Marks, as you do, who reminded me of another hidden section of wall back over at Tower Hill that I read about in the Survey of Antiquities but had dismissed at the time as likely to be out of date information and no longer visible. 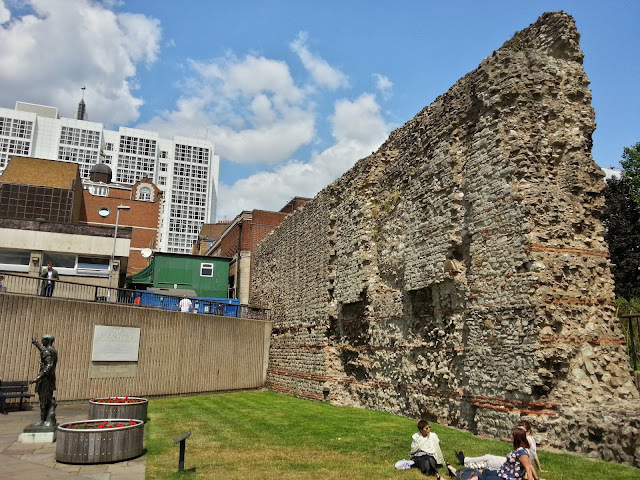 So having an excuse for another blog post, I headed back over towards the Tower Hill area to find this hidden wall and whilst in the area thought I might as well visit the less "obscured" sections of wall in that area too. 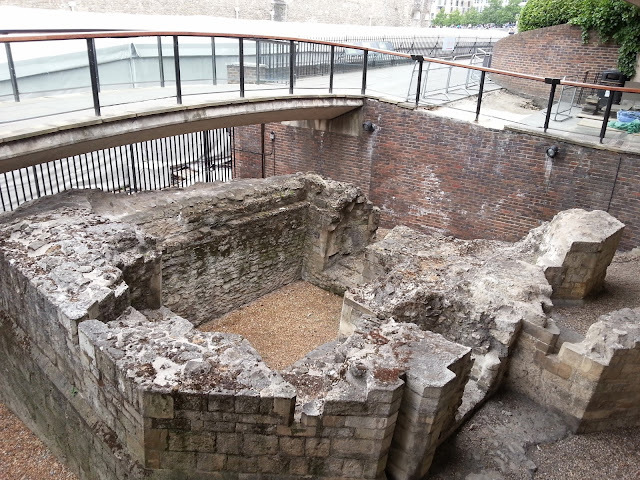 The Tower Hill area has some the best preserved and impressively large sections of the city wall. The sections under ground and hidden in basements I have already written about in earlier posts, but the two large and easily accessible sections do deserve attention, even if not "obscured". The first and most obvious of these sections being the very large remnant of city wall in Trinity Place, immediately by the main entrance to the Tower Hill Circle and District line underground station. The second, less obvious, but even more impressive section is off nearby Cooper's Row, and is worthy of a separate post for itself. The Trinity Place section has only been made fully visible during the 20th century, where like others it been partially incorporated within buildings and with the older Roman layer still submerged below the modern ground level. 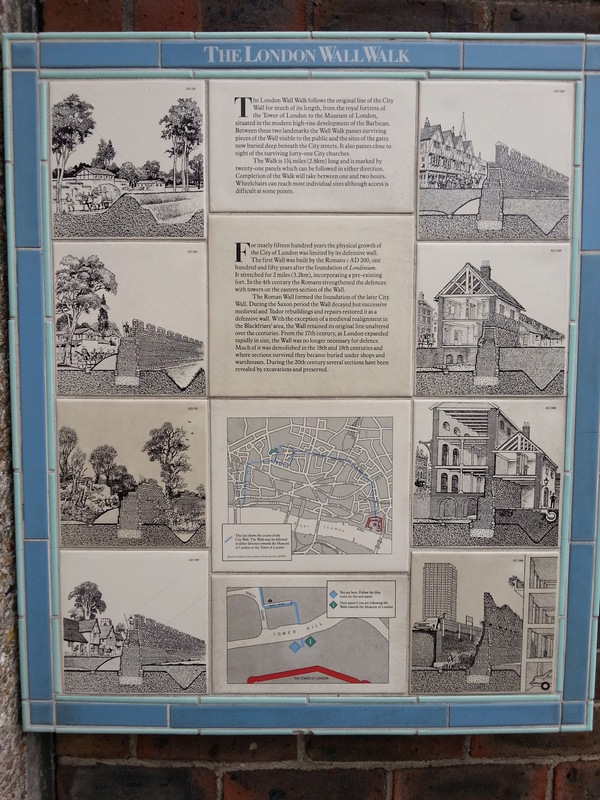 What is now revealed is one of the largest parts of the city wall remaining. Running for about 25m (82ft) and standing to a total height of 10.6m (35ft), with the now exposed Roman layer dating from AD 200, forming the lower part up to a height of 4.4m (14.5ft), and the remaining 6m or so being of medieval origin. The original Roman city wall is thought to have been about 6.4m (20ft) in total height, including the battlements, so the Roman section here is probably up to the height of what was the sentry walk level. The wall is best viewed from it's western (inner) side where the usual Roman method of construction using regular courses of squared kentish ragstone, spaced with red tiled bonding layers can clearly be seen. The face of the wall has been cut into at several intervals to support the once adjoining buildings of a much later period, exposing the less ordered rubble and mortar core. This is again noticeable at the southern end of the wall were the complete cross section is visible. 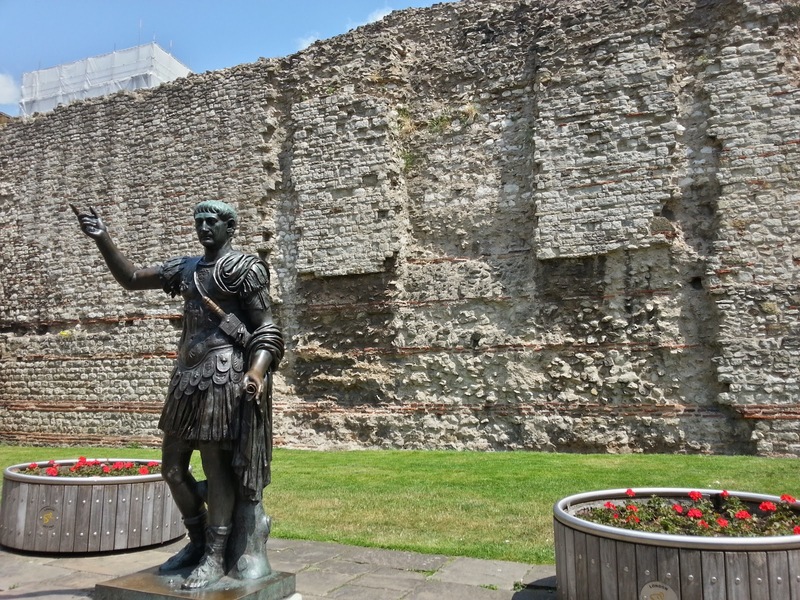 Just to the west of the wall stands a late-eighteenth century, bronze statue of Emperor Trajan. This statue was donated to the Tower Hill improvement Trust by the Reverend P. B. 'Tubby' Clayton MC, vicar of All Hallows by the Tower (across the road), after he had found the statue in a scrapyard in Southampton, and was placed here in 1980. Considered by the senate as "Best Emperor ever", Trajan who was emperor from AD 98-117 has no particular association with London or Britain unlike his adopted son Hadrian, of wall fame, who succeeded Trajan as emperor from AD 117-139. 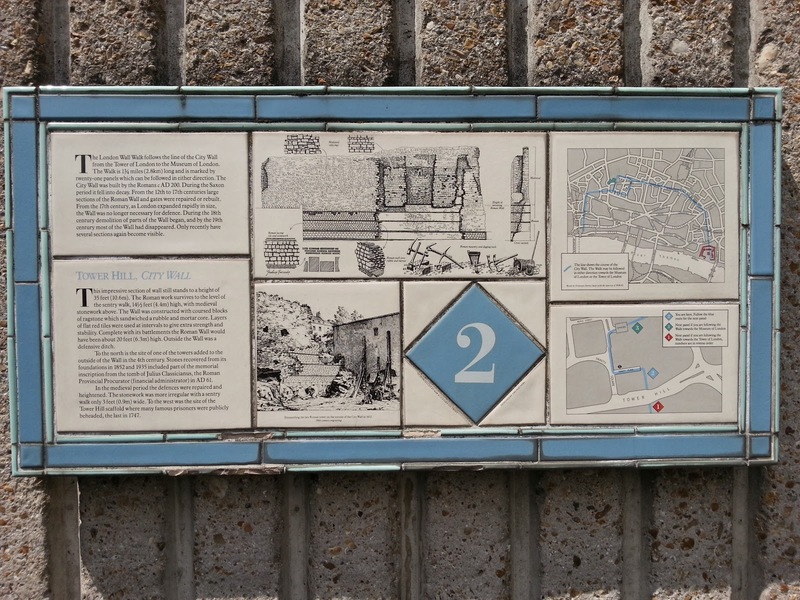 Here also is panel number 2, from the Museum of London's "London Wall Walk", giving details of this section of wall. Panel number 1 is meant to be just beyond the under-pass next to the remains of the medieval Postern gate to the south, but has been missing for a good while. It has been replaced by three small stainless steel engraved panels which are mounted on the railings around it. A postern gate is usually a small side-entrance, typically for pedestrians only. This one dates from about 1270, and was made of Caen stone, from Normandy, France, like the rest of the Tower of London. It was situated at the very edge of the moat to the Tower of London and due to this proximity it's foundations gave way and it partially collapsed in 1440. The gate was resited slightly north of the original location and rebuilt before becoming once again derelict and finally disappearing in the 18th century to be rediscovered again in 1979. There remains however Panel '0' or one the introductory panels still in place, marking the start of the walk, situated at the foot of the steps leading back up to street level from the south side of the under-pass. Immediately adjoining the northern end of the wall at Trinity Place, a section of wall 22.25m (73ft) long was uncovered in 1882 during the construction of the Inner Circle Railway. As can be seen in the photograph below, which shows the outer / eastern face, the wall was in good shape with the base-level plinth, four courses of rag-stone, three of tiles and a further six of ragstone visible. According to descriptions of the time there was a further bonding bonding layer with another four courses of ragstone when first uncovered, which I would estimate to make a total height of about 3.5-4m (11-13ft). 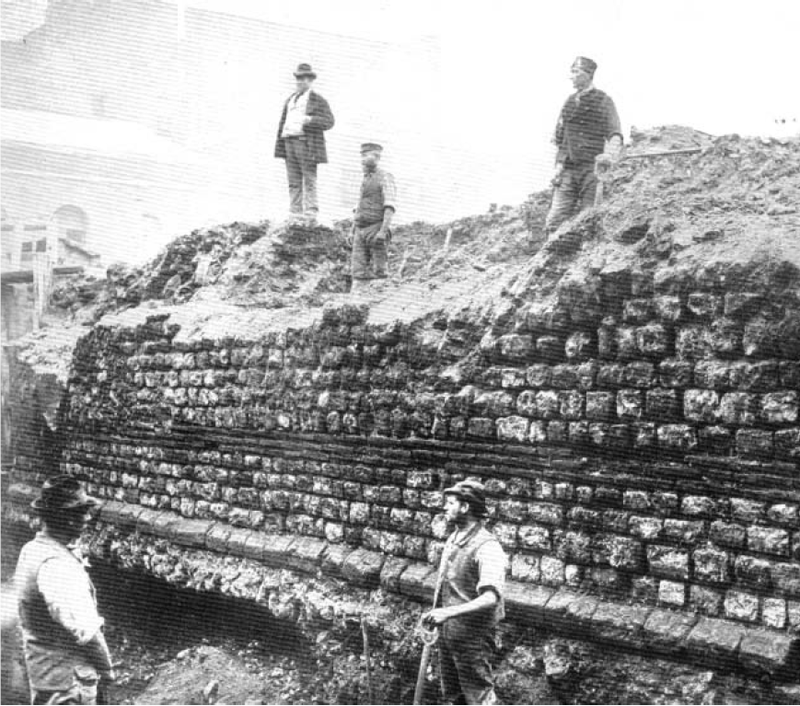 Demolition of Roman Wall at Tower Hill for Inner Circle Railway, 1882. Copyright Museum of London. 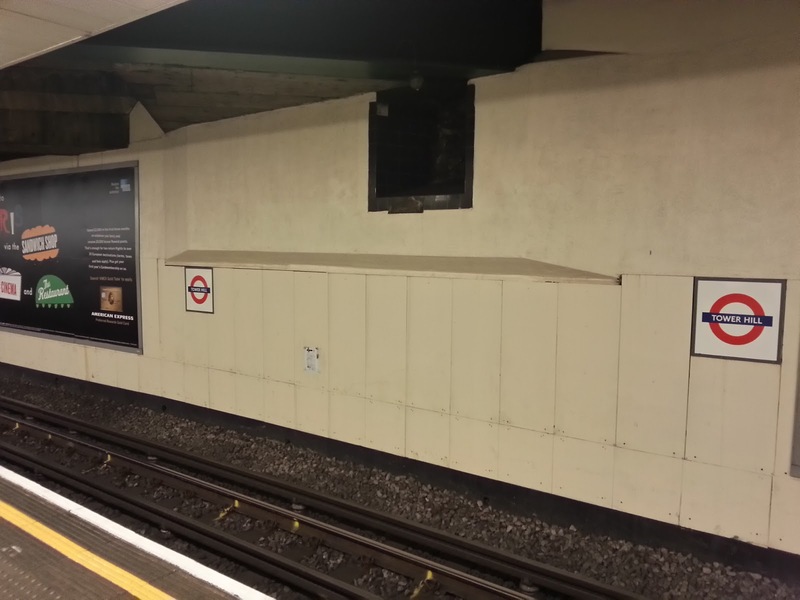 Unfortunately this section of wall was demolished to make way for Inner Circle Railway, but a small section was left visible within the station itself. To view it, you'll need to purchase a Tube ticket and head to Platform 1, the West-bound platform for the District and Circle line. Walk east along the platform (the direction the trains are coming from), and almost at the end up high on southern retaining wall (across the tracks) is a small recess, probably only a metre square, where you can see the exposed part of the Roman wall. 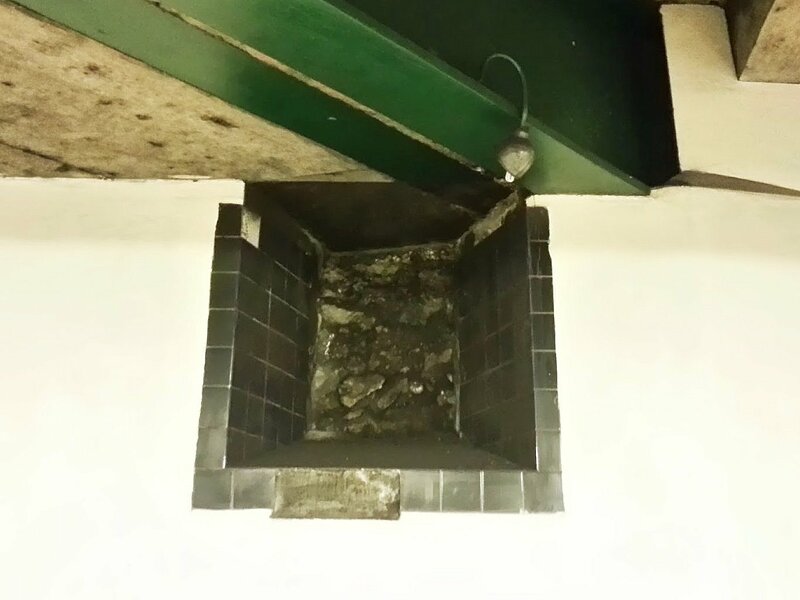 It looks like there is a spot light, but this was not working at the time of my visit and due the usual underground railway grime it looks rather like just any old dirty bit of brick work, but is in fact the remains the Roman city wall constructed some 1,800 years ago! Roman Wall - Detail. Platform 1, Tower Hill underground station.